Global digital diabetes management market expected to generate around USD 24.5 billion by 2025, at a CAGR of around 23.6% between 2019 and 2025. 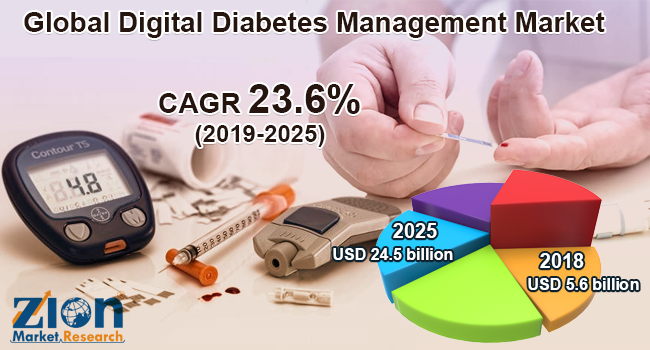 The increasing prevalence of diabetes worldwide, rising geriatric population base, and growing penetration of smart devices, digital platform, and adoption of mobile apps are likely to fuel the global digital diabetes management market in the future. The report a covers forecast and an analysis of the digital diabetes management market on a global and regional level. The study provides historical data from 2016 to 2018 along with forecast from 2019 to 2025 based on revenue (USD Billion). The study includes drivers and restraints of the digital diabetes management market along with the impact they have on the demand over the forecast period. Additionally, the report includes the study of opportunities available in the digital diabetes management market on a global and regional level. In order to give the users of this report a comprehensive view on the digital diabetes management market, we have included a competitive landscape and an analysis of Porter’s Five Forces model for the market. The study encompasses a market attractiveness analysis, wherein all the segments are benchmarked based on their market size, growth rate, and general attractiveness. The report provides company market share analysis to give a broader overview of the key players in the market. In addition, the report also covers key strategic developments of the market including acquisitions & mergers, new product launch, agreements, partnerships, collaborations & joint ventures, research & development, and regional expansion of major participants involved in the digital diabetes management market on a global and regional basis. The study provides a decisive view of the digital diabetes management market by segmenting the market based on type, product and service, end-user, and region. By type, the market is segmented into wearable and handheld devices. By product and service, the market is segmented into devices, digital diabetes management apps, data management software and platforms, and services. The devices segment is sub-segmented into continuous glucose monitoring systems, smart glucose meters, smart insulin pens, and closed-loop systems/smart insulin pumps and smart insulin patches. The digital diabetes management apps are sub-classified into diabetes and blood glucose tracking apps and weight and diet management apps. By end-user, the market is segmented into individuals/home healthcare, academic and research institutes, hospitals and specialty diabetes clinics, and others. Some key players of the global digital diabetes management market include Medtronic, Dexcom, B. Braun, Abbott Laboratories, Tandem Diabetes Care, Insulet Corporation, Lifescan Inc., Ascensia Diabetes Care, AgaMatrix, Glooko Inc., Tidepool, and Dariohealth, among others.